Urban Environmental Science – why is it important and what is the big deal? Urban and Environment – two terms that some might perceive as contrasts to one another. But let’s think about it. Over 50% of the global population currently resides in cities. Cities are seen as opportunity havens and projections suggest the global population living in cities will surpass 60% by 2050 (UN 2016). That’s a lot of people living on a relatively small area of land. Traditionally, we have created sanitary cities where the objective was to remove waste through engineered infrastructure (think sewers) and move water along controlled waterways (think channelized or buried streams). Nowadays, we are understanding the value of green areas in cities and are moving towards studying the urban environment to improve city design and make it more sustainable. Cities like New York City, São Paulo, Mumbai, and Shanghai lost their designation as natural areas long ago. Of course, the establishment of cities is a remarkable feat in engineering and allows for the rapid transfer of goods and ideas. This is also the reason that people are drawn to these places. Yet, as this happens, we become more and more disconnected from green spaces and other resources. As humans, like any other living organism, we rely on these environmental resources: water, soil, air, and the products of these resources, like food, timber, and so forth. Scientists have studied these resources for a long time, but often research takes place far outside of cities. For example, in the United States, the Natural Resources Conservation Service, tasked with developing a national map of all soil types, has traditionally avoided urban areas when mapping soil types. This was in part due to a perceived lack of importance, but also because it seemed too difficult to find places in cities where soil scientists could easily dig a hole to identify and study soils. This is now changing. Many more urban soils surveys are taking place in the United States, with cities like New York, Baltimore, Los Angeles, and Detroit being added to the database. In one way, this is to complement the otherwise rural areas that have been mapped (moving from ~95% land mapped in the U.S. to 100%), but it is also coming with the realization that grey infrastructure like sewer pipes, concrete sidewalks, and other impervious surfaces disrupt the natural cycles of nature. To make these cities livable and sustainable, it is not just soil scientists who are interested in the urban environment. Many scientists are now turning to study the environment in cities to inform decision making processes on how to manage our resources in urban areas. Studies in cities can, for example, investigate how a stream running through a neighborhood is impacted by having roads and other hard surfaces surrounding it, rather than forest soils that can help soak up runoff from the rain and pollutants. Researchers find that city streams have far worse water quality than those in rural areas, because they receive a substantially higher percentage of runoff from streets. Compared to soft soils, like those found in forests, streets can’t absorb runoff and instead act as conduits of runoff. This runoff can be loaded with pollutants like salt and pesticides, depending on the seasons. Studies of this kind are important, because they inform us how we should manage our resources. A study that measures salt concentrations in urban streams, demonstrates that we have to be more careful when applying salt to the roads in winter. So, if less salt, or preferably an alternative to salt, is applied in the winter seasons while still maintaining road safety standards, it can save cities incredible amounts of money while also improving the water quality of the stream, wildlife, and other environmental elements. Also, we must keep in mind that all streams flow into larger water bodies, whether they are larger rivers, estuaries, sounds, lakes, bays, or oceans. Since these environments are usually important to us for many reasons (tourism, fishing industry, enjoyment, transportation), we need to use the findings of environmental science studies in cities to guide our decision making. For example, the Great Lakes, Chesapeake Bay, Puget Sound and other large water bodies have benefitted immensely from studies that evaluated pollutant loads to the systems. Over the years, regulations were put in place to protect these valuable resources and we have seen vast improvements in water quality and habitat for fish and other animals, while city inhabitants now also have a place to recreate. Thinking ahead, scientists are now in the process of carrying out environmental science for cities to create a more sustainable place to live, work, and recreate. Topics in this area are generally concerned with studying how changes in the city environment (planting more trees, removing unused parking lots or vacant homes and turning them into parks) can improve the overall sustainability of cities. For example, scientists started to value the soil in cities, be it for urban agriculture in community gardens, installing a rain garden to soak up extra runoff that would otherwise end up in already taxed sewer system, to support a wildflower garden that gives bees some habitat, or to design a park that gives people a place to spend an afternoon. This approach, sometimes call green infrastructure or water sensitive urban design, to making cities more sustainable is one way that scientists and city planners are working together to create living spaces that can cope with the impact humans have on the environment. Many of these examples already exist, whether they are more recent additions to cities, such as the Highline in New York City, proposed projects like the Dallas Trinity River Park, or have been part of the city infrastructure for decades or centuries, like the Englische Garten in Munich, Germany or Central Park in New York. In either case, the reason of integrating these green spaces in cities always had the same objective: to give people places to retreat in the city. 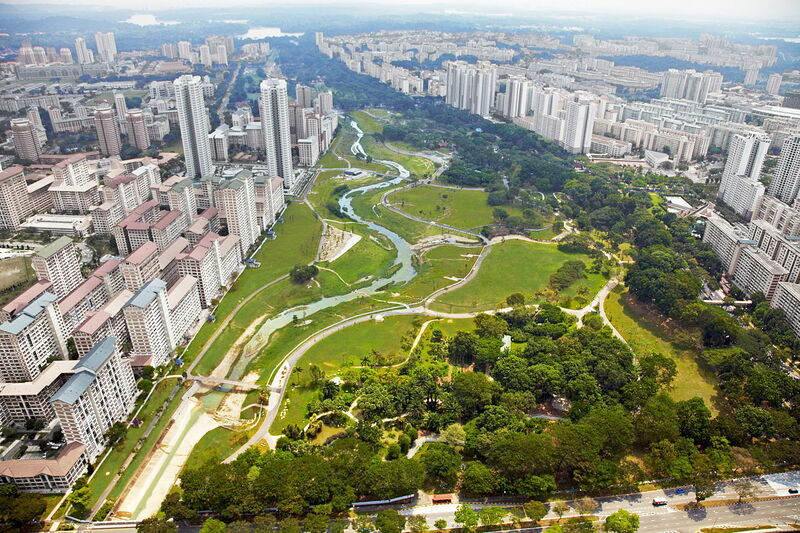 By incorporating greenness into cities, we are not only making urban life more enjoyable. We are also improving air quality, providing benefits that can regulate stormwater, and allowing soils to “breathe” and take up CO2. ← envirobites is starting soon!